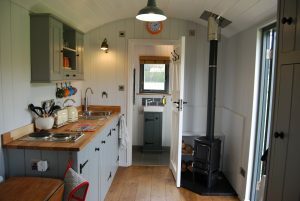 The Hut – a fabulous new addition to our Campsite! 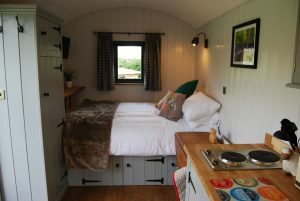 If you are looking for something different to your usual accommodations come and try our Hut! Its available during the Summer Months and is great for parents or grandparents who don’t want to camp but still want to be part of the camping experience! The Hut is situated at the bottom of the camping field. It has everything you need in it and is suitable for 2 people and 1 well behaved dog. Our campsite is very small and friendly and we don’t allow rowdy groups, it has a very mellow vibe with everyone sitting round their campfires in the evening. Prices vary from £70 to £100 a night. Contact us directly for the best rates.